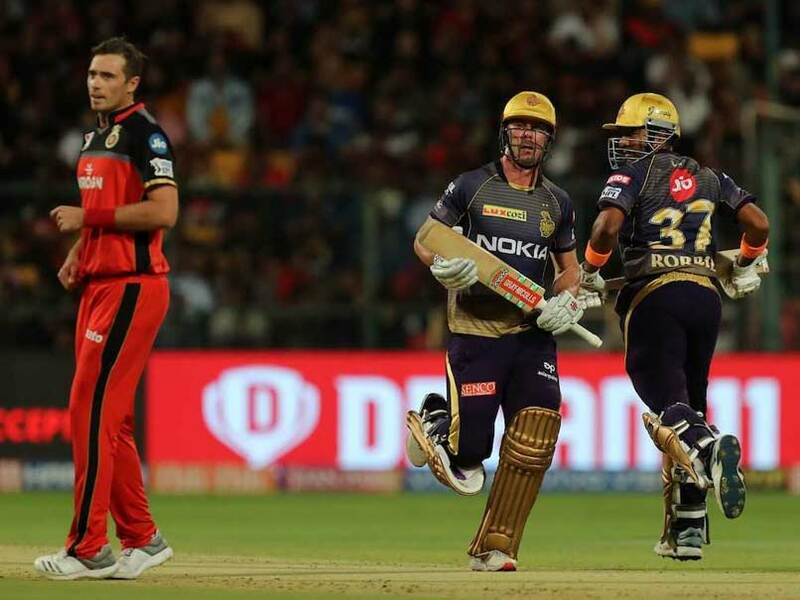 IPL 2019, Royal Challengers Bangalore vs Kolkata Knight Riders Highlights: Kolkata Knight Riders chased down the target with five balls to spare. IPL 2019 Highlights Between Royal Challengers Bangalore vs Kolkata Knight Riders, straight from M Chinnaswamy Stadium, Bengaluru. 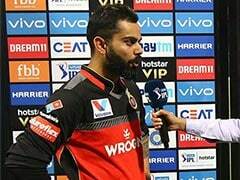 That brings an end to the 17th match of the IPL 2019 between Royal Challengers Bangalore and Kolkata Knight Riders in Bengaluru. Thank you for joining us for the live coverage. Shubman Gill takes a quick single as Kolkata Knight Riders defeat Royal Challengers Bangalore by five wickets in Bengaluru. Andre Russell stood unbeaten on 13-ball 48 as the visitors chased down the target with five balls to spare. Scores level! Andre Russell smashes it over the long on as Kolkata Knight Riders draw parity against Royal Challengers Bangalore. Superstar is back in town. It's raining sixes in Bengaluru. 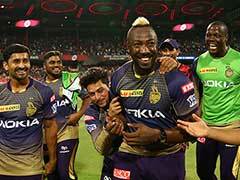 Andre Russell scores three consecutive sixes to lead Kolkata Knight Riders' charge in run-chase. Incredible! Andre Russell picks up a length ball by Tim Southee to get his fourth six. It brings Kolkata Knight Riders close to the target. Huge! Andre Russell has scored three consecutive sixes for Kolkata Knight Riders. He's truly a game-changer for the visitors. Andre Russell displays sheer power and hits a maximum off the free hit. It keeps some hope alive for Kolkata Knight Riders. Andre Russell gets a maximum for Kolkata Knight Riders off a no ball by Mohammed Siraj. Siraj is now off the attack. Navdeep Saini strikes back after being hit for a six. Dinesh Karthik departs for 19. Kolkata Knight Riders are 153/5 in 17 overs, need 53 runs in 18 balls. Dinesh Karthik pulls it away for a maximum to shoulder the responsibility. Dinesh Karthik defeats Virat Kohli on the field, gets a boundary for Kolkata Knight Riders. Yuzvendra Chahal traps Nitish Rana on the very next ball. Heinrich Klaasen makes no mistake an takes an easy catch to dismiss Rana for 37. Mohammed Siraj puts down another catch. Nitish Rana gets a lifeline. Nitish Rana concludes the over with a maximum, straight like an arrow. It takes Kolkata Knight Riders to 134/3 in 15 overs. A much needed boundary for Kolkata Knight Riders. A boundary after 21 deliveries. Nitish Rana smashes Pawan Negi to take Kolkata Knight Riders to 126/3 in 14.3 overs. Excellent over by Yuzvendra Chahal. Just six sixes off the 14th over. Kolkata Knight Riders need 86 runs in 36 balls. Navdeep Saini bowls a brilliant over. Just three runs off it. Kolkata Knight Riders are 114/3 in 13 overs, need 92 runs in 42 balls. Pawan Negi strikes again, castles Chris Lynn for 43. It keeps Kolkata Knight Riders in check as they have lost their third wicket. The visitors need 98 runs in 51 balls. 5 runs! 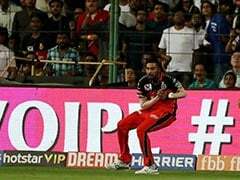 Royal Challengers Bangalore have returned to their sloppy fielding against Kolkata Knight Riders in Bengaluru. A 200-plus score now looks small for Royal Challengers Bangalore. Nitish Rana plays an excellent cricketing shot to get his first six. It takes Kolkata Knight Riders past 100 in chase of 206. Mohammed Siraj puts down Chris Lynn on 42. The batsman gets another life. Kolkata Knight Riders are now 110 runs away from the target. Pawan Negi strikes after claiming a stunning catch. Robin Uthappa departs for 33. And that brings an end to a 65-run stand for the second wicket. Kolkata Knight Riders are 92/2, need 113 runs in 61 balls. Chris Lynn smashes a juicy full toss over the mid wicket to get his second six for Kolkata Knight Riders. It was a six off the no ball, which means a free hit for the big man. Robin Uthappa expresses confidence with that shot. Mohammed Siraj errs in line and Uthappa deflects it fine leg to get his fourth boundary. Robin Uthappa punches it to deep backward point to get another boundary for Kolkata Knight Riders. That's huge! Chris Lynn connects with the spin and smashes it across the ground it seems. It takes Kolkata Knight Riders to 59/1 in 5.5 overs. FOUR! 50 up for Kolkata Knight Riders in five overs. A classic shot by Robin Uthappa takes KKR to the 50-run mark. Chris Lynn connects well with a short pitched delivery by Tim Southee, pulls it away to score back-to-back boundaries. Chris Lynn clears the fielder to get a one-bounce boundary for Kolkata Knight Riders. Top edge but a boundary for Robin Uthappa. The lucky batsman managed to guide the shortish ball over the head of wicket-keeper to get his first boundary. Excellent over by Tim Southee. He concedes just three runs in his second over. Kolkata Knight Riders are 31/1 in 3 overs. Pawan Negi takes a spectacular catch as Navdeep Saini dismisses Sunil Narine for 10. Kolkata Knight Riders are 28/1 in 1.5 overs. KKR have lost their first wicket early in the chase of 206. Sunil Narine times a juicy full toss well to get his second boundary. Sunil Narine is finally off the mark with a boundary. It takes Kolkata Knight Riders to 21/0 in 1.3 overs. Chris Lynn follows it up with back-to-back boundaries. Lucky and a solid start for Kolkata Knight Riders in a tough chase of 206. KKR are 17/0 after the first over. Chris Lynn dropped in the first over. Navdeep Saini is the culprit, though it wasn't an easy catch for a diving Saini. Sunil Narine and Chris Lynn are out in the middle to start Kolkata Knight Riders' chase of 206. Tim Southee to open the attack for Royal Challengers Bangalore. Royal Challengers Bangalore score 205/3 in 20 overs against Kolkata Knight Riders. Marcus Stoinis finishes it up with a boundary. Now, RCB have a confident total to defend at home. Marcus Stoinis picks up the slower ball over the mid wicket to get a maximum for Royal Challengers Bangalore. Marcus Stoinis gets a full toss from Prasidh Krishna and smashes it to deep backward point for a boundary.